Scientist drawing collected by Julie Libarkin. Credit: Scott E. Kalafatis and Julie C. Libarkin, Geosphere. "Over the years, scientists have received a lot of criticism about how they engage in policy discussions," says co-author Scott Kalafatis, assistant professor at Dickinson College. "But I've worked with a lot of scientists who were remarkably dedicated and skilled at engaging in the policy process." Yet, despite these efforts, Kalafatis says it's still unclear how scientists see themselves in those interactions, and some are unsure of how they might best leverage their strengths into policy decisions. 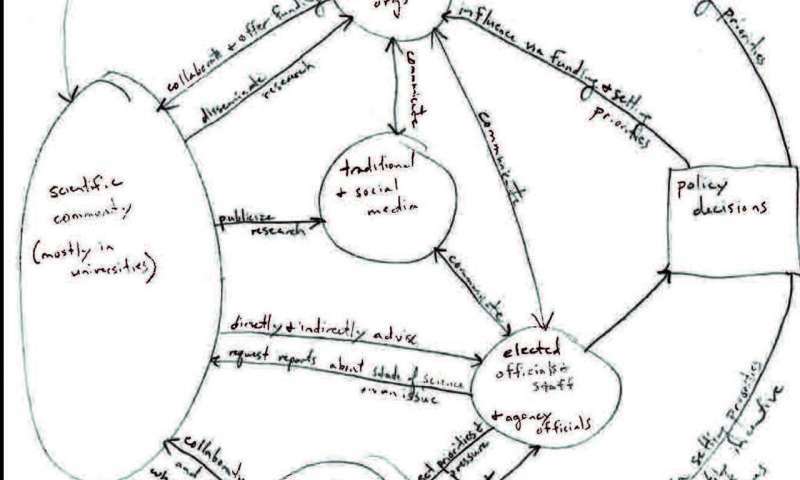 In their new paper for Geosphere, Kalafatis and his co-author Julie Libarkin investigate how scientists in all stages of their career perceive interactions with policy makers. They discovered that there's not a one-size-fits-all approach to interactions between scientists and policy makers—and relying on your strengths can be the most effective way to communicate. The team believes that these scientists' impressions of how science and policy connect with one another depended very much on who they were, where they were in their career, and where they wanted to be in the future. The researchers note that highlighting the five science-policy models is an important initial step to helping scientists tailor their approach. "In my opinion, there's not 'one neat trick' to make scientists engage more effectively with policy," says Kalafatis. Instead, he says the most effective approach is tailored to people's particular personality, career, and experiences. Scientists on Twitter: Preaching to the choir or singing from the rooftops?